I can’t deny that it’s been an exciting month for me. 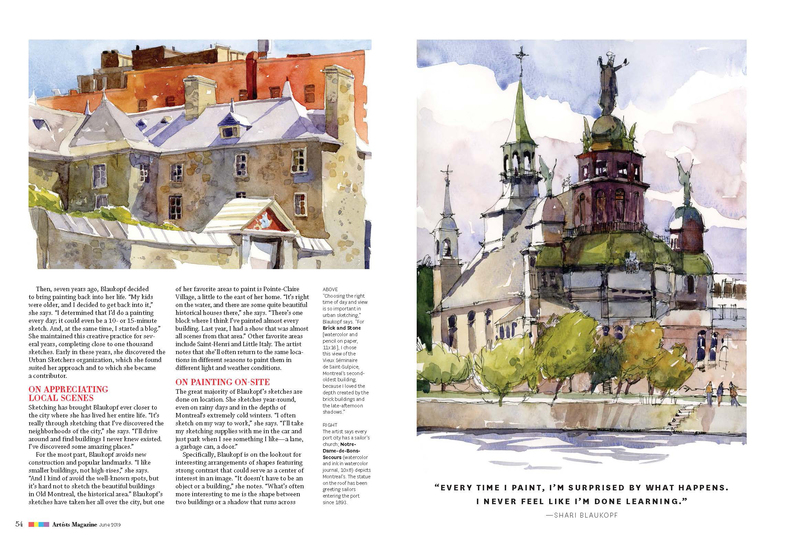 Besides the release of my book, I’m honoured to have my Montreal sketches published in the June 2019 issue of Artists Magazine. 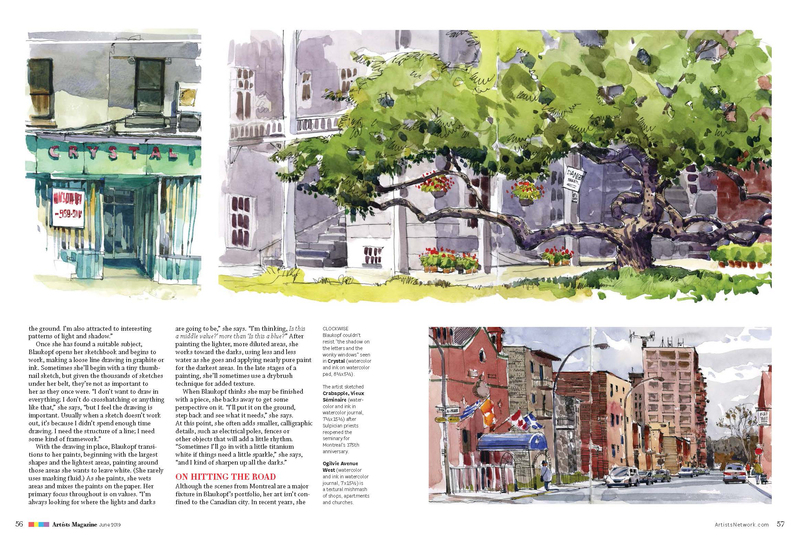 Thanks to Anne Hevener for creating this special issue featuring cityscapes (in ink, watercolour and oil), and Austin Williams for the great interview. It makes me proud to see my city here. It was warm enough today to take a little tour of the mess in my backyard. I found a thick mat of oak leaves and enough sticks and branches to fill ten bins, but I wasn’t expecting to see any signs of life just yet. Surprisingly, though, I discovered some crocuses blooming near the shed, so I ran back in to grab my sketchbook. Seems like a miracle to see blooms, doesn’t it, after this difficult winter in Montreal? 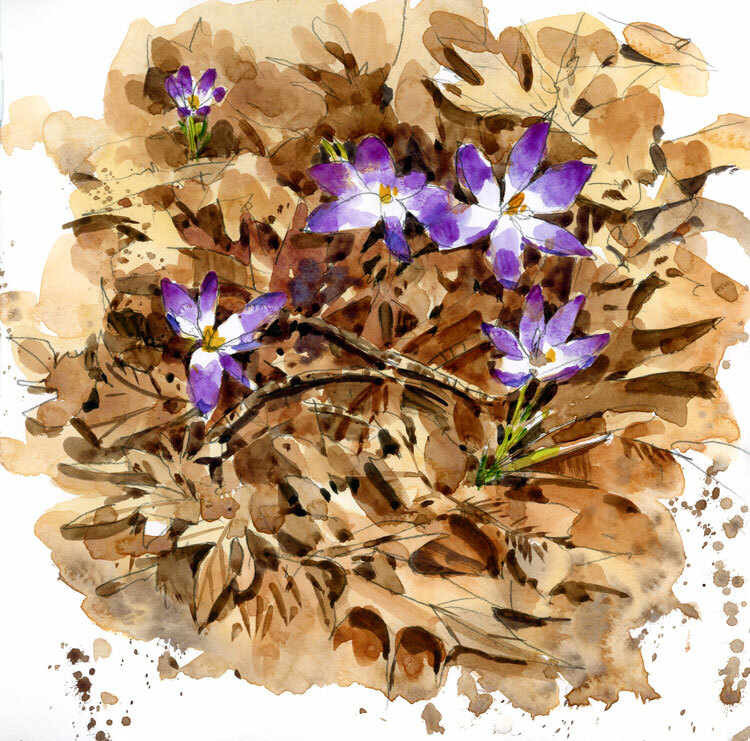 For this sketch I really wanted the crocuses to look like they were emerging from a thick layer of leaves. After my pencil drawing I did an initial wash of diluted Burnt Sienna, painting everything except the flowers. When that was dry, I wet each bloom with clear water and added Cobalt Violet to the outer edges of the petals and let the full-strength pigment bleed into the clear water. The rest of the sketch was negative painting. I surrounded each oak leaf shape with progressively darker washes and shadow areas, and added a bit of splatter too, to reinforce the texture of the post-winter tangle in the garden. The darkest areas were saved for right around the flowers. Sketched in a Travelogue Watercolour Journal. My easel and I spent a bit of time at the Morgan Arboretum today, watching the chipmunks and waiting for spring. Tiny buds can be seen on the trees but there’s little colour in the landscape — mostly grey branches and decaying leaf mould. For this kind of day a subtle palette is best. I used lots of opaque colours: Cerulean Blue, Raw Umber and Cadmium Red were the base for my mixes, with a little Transparent Orange thrown in for brightness. Painted on a quarter sheet of Arches 140 lb Rough. Every once in a while I love to take my tubes of gouache out to play. I find that the process applying opaque pigments onto toned paper is a great exercise in thinking about colour mixing. The real challenge in this one was figuring out what to do with the transparent bottles against the dark background. In reality, when I looked at them, the only thing I could really see was the highlights on the glass and the little bits of dried hot sauce on the inside of the bottles. The bottles themselves sort of dissolved in to the background. I tried to solve the problem by painting the transparent part of each bottle slightly lighter than the background grey, and then adding a few darks and lights to each one. Now that the sketch is scanned I notice lots of symmetry errors in my bottle drawing, but I had a lot of fun painting the brightly-coloured labels on these. I work very much the same way for this that I do with watercolour, except for the highlights (which in watercolour are the white of the paper): big shapes and mid-tone values first, followed by colour accents, then darks and finally the highlights. 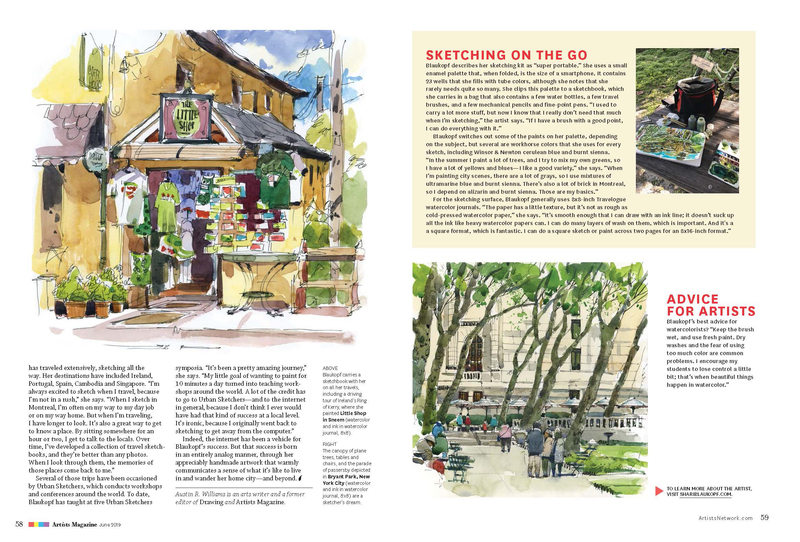 Other news this week: It’s a huge honour to have my work featured in the June 2019 issue of Watercolor Artist magazine. It’s the back page article called Open Book and it’s of a sketch of some gladioli that I bought at the Jean Talon Market last fall. On Sunday I painted what I thought were the last bits of snow in the woods, and I said my goodbyes to winter painting for this year. But today the joke’s on me. I’m watching yet another storm from my window, happy to be inside as the spring snow wreaks havoc on Montreal’s roads. Of course I had to take advantage and paint the wheelbarrow one more time. For this near colourless scene, I used a limited triad of Cobalt Blue, Alizarin Crimson and Quinacridone Gold. Mixing these three in different proportions gave me a wide range of neutrals, some warm and some cool. Painted on a pad of Arches Rough paper, 140 lb. I was out painting in my woods today, capturing the last bit of snow on the ground and enjoying the sound of a pileated woodpecker in a tree above me. The painting was almost done, and I stepped back to have a look and also take a photo for Instagram when a rogue gust of wind on this windless day knocked over my easel. Luckily I was standing close enough to catch it and save the painting, although my brushes and palette ended up in the muck. Back home, and after cleaning the mucky brushes, I made a few adjustments — softening the background and cropping for a better composition. By tomorrow this snow will be gone and that may be it for snow painting until next year. This is a viewpoint I often draw from in the summer when the boats are in the water, but I can’t wait that long. I had to get out today. It was the first day in a long time when both good weather and my schedule allowed for an hour of sketching. Even though the scene was quite drab, there was beauty to be found in the subtle colours of the budding trees and the partially melted ice on the lake. For this sketch I used a limited palette of mostly Cobalt Blue and Burnt Sienna. I usually combine Burnt Sienna with Ultramarine (below), but switching to Cobalt yielded a blue grey that was perfect for the icy lake. If you’re interested in exploring more limited colour palettes, there’s a whole chapter on them in my book, which is finally out in stores this month. 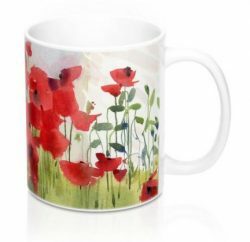 It’s thrilling to hear that people are finally receiving their orders from online retailers. I just heard from my publisher that the book is already being reprinted (copies are still available online! ), so I’m hanging on to the only copy I have until I can get more copies in June. 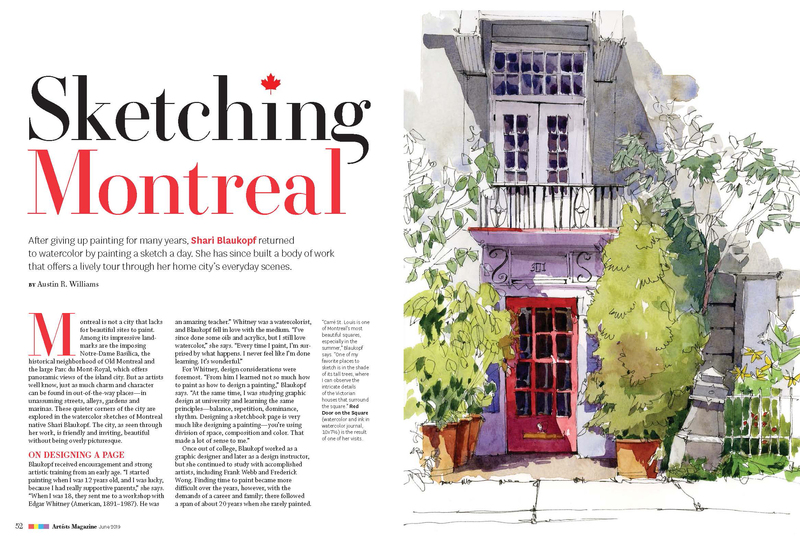 Also this month, in April’s Drawing Attention — the monthly Urban Sketchers newsletter — there’s lots of Canadian content: an interview with me as well as a piece about Urban Sketchers Ottawa. I love reading about all the regional chapters in Canada, and if you go back to last month you can read about USk Calgary too.